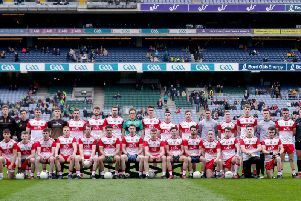 Two late, second half goals in Celtic Park helped Derry hurlers to a second National League win of the season to all but guarantee safety in Division 2B. Roscommon came into the game with two defeats from their two games while Derry had only two points from three but the Oak Leafers put in an assured display with Alan Grant and Ciaran Steele excellent throughout. Derry made the most of the first half elements but were wasteful at times and had to dig in after the break with Sean McCullagh marshalling the backline superbly. And after the frustrations of last week's defeat against Wicklow, Derry must have spent some time on the shooting range midweek because they started in emphatic fashion with 1-04 inside eight minutes. Kevin Hinphey and the impressive Ciaran Steele hit points in the opening two minutes before Kelly took advantage of some great work by Osin McCloskey whose blocked shot fell perfectly for the Ballinascreen forward to tap into an empty net for 1-03 to no score with only three minutes gone. The strong wind was aiding Derry's positive start but when Kevin Hinphey was harshly adjudged to have over carried, it presented Robbie Fallon with the opportunity to get the visitors on the scoreboard and he made no mistake. It didn't stop the Derry onslaught though as Steele set up Oisin McCloskey for a point and Alan Grant added a fourth seconds later. Another sporadic Roscommon attack yielded their second score when John Coyne split the posts but the first half remained about what sort of tally Derry could muster by the short whistle. Grant, from a free, McGilligan and Steels extended the lead to 1-07 to 0-02 inside 20 minutes but again Derry were guilty of passing up gilt edged goal chances. The best of these saw McGilligan charge through on goal with mean clear on either side. His shot was blocked but rolled clear with Gavin McCormick unable to pull on the ball on the ground with the net again unguarded. Roscommon made the most of that miss, hitting four of the game's next six points to reduce to deficit to 1-09 to 0-06, Grant and a lovely Aaron Kelly point from wide out along the left touchline the players on target for the home side. Another excellent Jonathan O'Dwyer point - this time from around 50m - and one from even further by Roscommon's Cathal Kenny completed the first half with Derry leading 1-10 to 0-07 but wondering just how big a factor the wind would prove in the second period. O'Dwyer and Coyne swapped points upon the restart and with the weather deteriorating Derry were forced to dig in as Roscommon took advantage of the elements at their backs to force the home side on the defensive. Points from Fasllon and substitute Adam Finnerty with his first touch brought Derry's lead back to four points as 1-11 to 0-10 and the visitors were sensing blood. Eamon Flanagan left a goal between the sides with his first point of the day but Steele eventually broke a 15 minute barren spell for the Oak Leafers which was quickly followed by a score from substitute Mark McGuigan for a 1-13 to 0-11 lead at the three quarter stage. The home side introduced Ruairi Convery to give them more of an attacking threat but it was Kelly who almost got in for a second Derry goal only to see his goal bound effort hacked away for a '45 by Roscommon's Peter Kellehan. Grant scored the subsequent 45 but Derry were now racking up the second half wides and allowing Roscommon to remain in the game. It needed a second goal and Banagher's Oisin McCloskey duly obliged when he latched on to Convery's flick to a gather possession and finish emphatically for a 2-14 to 0-12 lead. Darragh Cartin's injury time goal put the seal on an impressive finale that put the game beyond Roscommon and brought Derry a welcomed second league win.